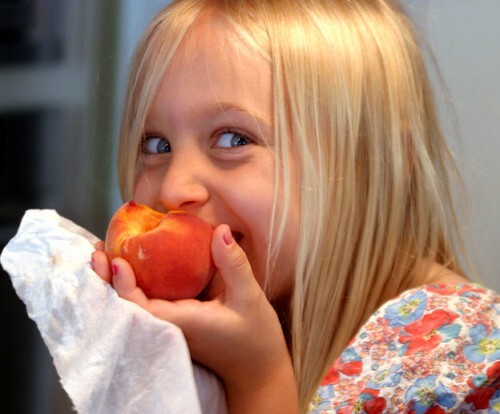 A child eating a Georgia Peach and loving it. Hannah was a picky eater, and all her mother could get her interested in were hot dogs, macaroni and cheese, and chicken nuggets. At least she was eating, her mother told me when I came to help them. Hannah barely responded to me until I changed her diet. Food is life. Food is health. Or, food can be the source of frustrating behavior problems, debilitating energy loss, even sickness. What you eat, and especially, what your children are eating on a regular basis, is absolutely crucial in determining their health, well being, and behavior. They are such beautiful beings—and they rely on us for so much. The good news is that you get to decide: What will you feed them? Anna, here. Barbara, you must have read my mind. How am I going to change the cavemen’s diets? If your kids love fried food like French fries and chicken nuggets, try baked versions, which are much lower in fat. Slice up a real, whole potato, spray with sesame oil, sprinkle with salt, and bake at 400 degrees for about 20 to 30 minutes or until crispy. Add some berries or apple slices, and you’ve got a delicious home-cooked meal that resembles fast food! If sweets are the weak spot, keep a bowl of easy-grab fruit on the counter and fresh cut-up fruit in the refrigerator. Make homemade trail mix with almonds, peanuts, raisins, dried cherries, and dark organic chocolate chips and put it in baggies for easy snacking, or buy boxes of raisins and packets of peanuts. Also try high-fiber, low-sugar granola bars; wholegrain cookies; and fruit leather. If it’s available and easy to grab and sweet, your child will probably go for it. Once you’ve got a handle on the one thing you want to change, you can start looking around at the rest of your child’s diet and making little upgrades and tweaks. What are some of your favorite recipe hacks for your kids? Have a favorite chicken nugget recipe? Or a gluten free chicken nugget recipe? Big people like these recipes too. Have any great healthy, organic snacks to share? Popcorn balls? Fruit snacks? How to make fruit leather? Have you radically changed your kids’ diets to healthy ones? Tell us about the transformation. Disclaimer: For every book you buy, I make a teeny amount of money to help Green Talk deliver its awesome content. What better way to support Green Talk then to change your children’s lives? Excellent article! I have a picky eater too and she loves baked chicken nuggets. I roll them in a panko breadcrumbs for a little extra crunch and gobbles them right up!